Bishop Tracy S. Malone announced the following clergy appointments and/or changes of status since publication of the April 1 E-News. Unless noted otherwise, appointments are effective July 1, 2019. Each Gospel writer tells the resurrection story differently. The one thing they all have in common is that the experience of the Risen Christ came as a surprise. Jesus predicted his death and it happened just as he said it would but most of the people around Jesus at that time, including the disciples, had very little, if any, expectation that resurrection would actually happen. They were caught by surprise. Read the Bishop’s message in its entirety. This year’s offering will support three ministries: the Urban Mission in Steubenville, Africa University, and the Bishop’s Discretionary Fund. Each will receive 1/3 of the offering, which last year totaled $24,705.50. The offering will be collected during the afternoon business session on Wednesday, June 12. Each pastor and church in our East Ohio Conference is encouraged to give generously. Register by May 1 and your camper will receive a limited-edition 2019 Summer Camp t-shirt that is not available in the camp store. You will also get $20 off your camper’s summer camp fee. Saturday, April 27 from 2:00 – 6:00 p.m. come spend the afternoon at Wanake’s Resurrection Egg Hunt and Wanake Preview Day as we celebrate the resurrection of our Lord and Savior. It’s an egg hunt all over camp, complete with more than 2,000 Resurrection eggs, candy, and prize eggs. Bring a friend! Admission is FREE! For more information visit us online at www.campwanake.org or call (330) 756-2333. The house at 314 E. Third Street in Lakeside Chautauqua is a place for those 35 and younger to go to recharge … your devices, your body (coffee, water, and snacks provided), and your soul with free Wi-Fi during breaks at Annual Conference. Meet and greet at the house Sunday, June 9 with a cookout at 6:00 p.m. and worship at 8:00 p.m. All young adults welcome! For those who cannot stay for the week, come spend a day together with East Ohio young adults at Lakeside. You can worship at 10:30 a.m. in Hoover Auditorium, hang out at the house, kayak, play tennis, or take advantage of other Lakeside recreational activities, with NO gate fees! Join us nightly Monday, June 10 – Wednesday, June 12 at 10:00 p.m. for devotions! Learn more about the young adult house. Together on Native American Ministries Sunday, May 5, we can empower local spiritual development and educate Native American seminary students to serve God faithfully. As part of your congregation’s preparation for this Special Sunday in The United Methodist Church consider how small groups can engage in studies to learn more about the Native American members of our denomination. Your generous support of that day’s special offering will provide Native American seminary scholarships and outreach that honors and celebrates Native American heritage, culture and communities. Download pastor and leader’s kit. 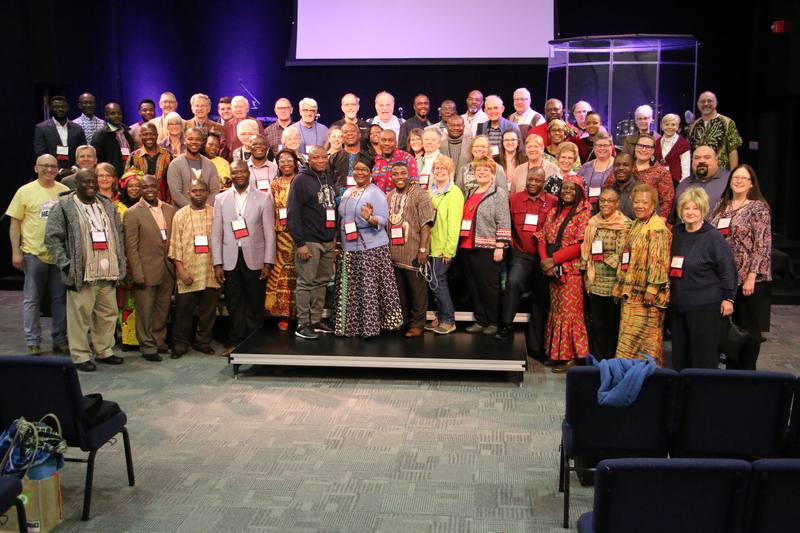 Eighty-four people representing 17 conferences and four General Agencies of The United Methodist Church gathered April 4-5 at Garfield Memorial Church (North Coast District) in Pepper Pike to discuss how each walks side by side in ministry with the Liberia Annual Conference (LAC). The Town And Rural Resource Programming (TARRP) consortium of the East and West Ohio Conferences invites clergy and laity of small-membership churches to its April 27 event at Pleasant Grove UMC in Muskingum County. Bishop Tracy S. Malone will be the keynote speaker for the event. This year’s theme is Envision How Your Local Church Can Transform Your Community and the World. Worship will begin at 9:00 a.m., followed at 9:30 a.m. by Bishop Malone’s address. Lunch, a district superintendent panel, and a faithful lay ministry workshop are all included with your registration. In the April 15 edition: During Holy Week when we recall perhaps the greatest violent assault on love we focus on nonviolent communication and how we might best deal with violence in our world, in our families, in our churches and in our denomination. A Way Forward: The violence we do to one another even in the church. When has being right ever led you to being closer to another. Ultimate Reliance; Breakthrough Prayer Practices for Leaders shows how adding breakthrough prayer to congregational and church leadership groups can change everything, transforming what might have become routine administrative work into a God-led spiritual adventure. Chosen: Finding Your Eternity in Christ Sermon Series will help both believers and seekers understand the purpose and call of God on every person’s life. Through these topics, churches will help their members discover life changing truths that exist in an identity rooted in Christ. The Authenticity Challenge: 21 Days of Loving God and Neighbor invites you to embrace authenticity in three key areas of your life: vocation (the What), relationships (the Who), and faith (the Why). Over the course of 21 days, you will be guided through seven daily challenges each week related to one of these areas. Reckless Love: Jesus’ Call to Love Our Neighbor considers your life, and teaches how loving the people around you will completely renew your faith and give you a new experience of loving God. Neither does Planned Parenthood, an organization that offers birth control, family planning and health and wellness services along with safe abortions. But you wouldn’t know this by viewing Unplanned, a new film based on the memoir of Abby Johnson (Bratcher), a former director of Planned Parenthood who later left the organization to become involved with the pro-life groups “Forty Day for Life” (well represented in this movie) and “And Then There Were None”. Bratcher’s conversion story follows a convincing trajectory: She had two abortions while young and then volunteered at Planned Parenthood before eventually joining their staff. Viewing an ultrasound of a 13-week-old fetus during a routine abortion convinced her that she was participating in ending a life. And she saw the light. As spring rolls in, new homes for sale hit the market! Whether you are looking to relocate, or expand or downsize your space, UMFCU is here to help! Get the process started by calling Christine Smith in our Cincinnati office at (800) 373-1059 ext. 12, or by emailing her at csmith@umethodist.com. On Friday, April 19, all offices of The United Methodist Financial Credit Union will be closed in observance of Good Friday. Members may view share account balances, pay bills, and transfer funds any time through our website, www.umethodist.com. Rebecca S. Swartz, Local Pastor, died April 7. Donald R. Dolick, retired Elder, died April 8. Charles R. Garner, clergy spouse, died April 5. Maxine Hayes, clergy spouse, died April 1. John Wienke, clergy spouse, died March 21. The next scheduled edition of the E-News is Monday, April 29, 2019. Deadline for submission is Thursday, April 25. Send articles to swilliams@eocumc.com.